ORMOC CITY- The historic bells of Balangiga town, Eastern Samar are to return to the country on December 11. This was announced by Defense Sec. Delfin Lorenzana in his remarks during the joint meetings of the Regional Peace and Order Council, Regional Development Council, and the Regional Disaster Risk Reduction and Management Council held in Ormoc City Monday (Dec.3). “Yung bells of Balangiga are coming back home on December 11 in the morning in a very simple ceremony in Villamor Air Base,” Lorenzana said to the applause of the council members. He said that he learned on this development through a staff of US Defense Sec. James Mattis. Lorenzana said that they will first ask the availability of the President for the bells’ eventual return to Balangiga, suggesting that no less than Mr. Duterte will be leading the restoration of the historical items in Balangiga. “We are just looking on the availability of the President. But I suggested not to take this long in Manila and bring them to Balangiga right away,” he said. “So we are looking at December 15 for the turnover in Balangiga,” he added. 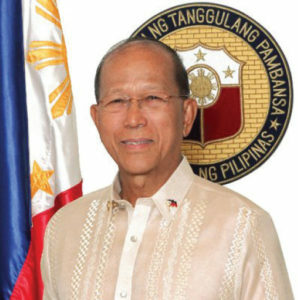 This way, the people of Balangiga would start the holding of their Misa de Gallo with the iconic bells pealing across the town, Lorenzana said. Lorenzana said that the two bells are now temporarily deposited in an air base in Guam and together with the other one in South Korea, will be repatriated back home. He said that the bells previously displayed at F. E. Warren Air Force in Cheyenne, Wyoming underwent repair. “And I saw in the photos, they are beautiful (after the repair),” he said. “So, this is a good news for Eastern Visayas,” Lorenzana said. Mattis led the turnover of the bells on November 15(Philippine time) during a ceremony at the F.E.Warren Air Base and accepted by Philippine Ambassador to the US Jose Manuel Romualdez. The bells were used by the Filipino resistance fighters to signal the attack on the American detachment in Balangiga on Sept. 28, 1901. At least 54 American soldiers were killed and 18 others were wounded in the attack. An outraged American Gen. Jacob Smith deployed 180 soldiers on Sept. 29, 1901 and ordered them to turn the town into a “howling wilderness” where every Filipino male, at least 11 years old and capable of carrying firearms, was killed while communities were burned down. Not contented with the killing of thousands of Filipinos, American soldiers took the Balangiga bells as their war trophies.